It’s Thanksgiving here in the USA, so Happy Thanksgiving! I wrote this quick note yesterday (Thanksgiving eve) because I knew exactly where I would be at this time… in the kitchen! Between mashing the potatoes, dressing the stuffing, and getting our favorite cranberry sauce in a bowl (nothing but the very best taste for us, thanks to Ocean Spray Jellied Cranberry Sauce — and I really mean that!) I will be busy getting our yearly lunch/dinner on the table. The fact that it will take me all day to prepare, and half an hour to eat (at the most! ), bothers me not! And a Happy Thanksgiving! right back at you, Danna. I got an early start this morning and am taking a break so I am not completely done in when it is time to enjoy the meal. It sure does take a lot of prepping for the one meal, Andie! Gotta love that cranberry sauce in the can! My favorite, too! Hope you had a good holiday. I’m am so there with the cranberry jelly. I had dinner at my parents house. They do a turkey and a ham and we (the siblings and myself) all bring the sides mashed potatoes, sweet potatoes, mac and cheese, deviled eggs, green bean casserole, squash casserole, etc then the pies pumpkin, apple and chocolate. All the prep and cooking time and you are so right dinner/lunch is over in a flash and all that’s left are leftovers (yum) and the need to take a nap. I am ready to do it again at Christmas. Man, Denise! There is something to be said about having a large extended family! Three types of pies to choose from!!! Yowee-Yum! Happy Thanksgiving to you, Danna! 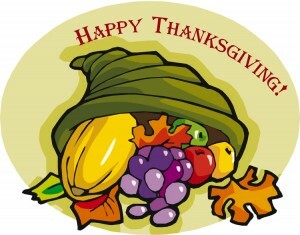 I’m thankful for such a wonderful cozy mystery site and such nice people who post to it. 🙂 It is always a pleasure to read! I’ve shared it with many friends who also enjoy reading cozies. Thank you, Donna! The Cozy Mystery readers who participate here are a great bunch! I’m thankful for them, also! I’m not American, but I hope everyone reading who is, has a wonderful day! Thank you, Susan, for the well-wishes! You are one of the great posters who Donna is referring to! ( Blushes ) Thankyou, and you’re welcome! Thanksgiving is over, but it was a pleasant one. We had dinner at my daughter’s house. She made her own cranberry jelly but neglected to add sugar. Yetch. Give me Ocean Spray any day. Oh, Regina, your poor daughter! If she is anything like I am, she is probably concentrating on the absence of sugar in her cranberries, instead of patting her back for all of the many things she did in order to make it a great Thanksgiving get-together. Regina, this reminds me of my younger sister, who thinks she is a Julia Child wantabe. One time she made pumpkin pie but didn’t have any regular granulated sugar. Thinking sugar is sugar she used confectioners sugar!! Talk about YUK! These pies were horrible! Whenever she tries cutting my cooking down I promptly remind her of those pumpkin pies! Happy Thanksgiving, a day late! We had turkey soup for leftovers today–and the leftovers are just beginning!!! HAPPY THANKS GIVING!!! It was a wonderful day. The weather has been holding out for us. It has been warmer then normal. It was nice to have fresh air in the house while we ate. Then a nice walk on the bike path along the Mohawk River. We have so much to be thankful for. But we still remember those in our area who have suffered lately. I hope all had a wonderful day. Margaret, it sounds like you did, indeed, have a wonderful day. One of the things that I am thankful for is your website. I really enjoy it very much. THANK YOU, DANNA! Thank you, Raynette, for the kind words about the site. I’m really glad you enjoy it. Susie, I am still laughing at your story! Hope everyone had a good Thanksgiving. Now for the next holiday! Why do some people call the next holiday “The Holidays” but then say New Year’s Eve? Why can’t the “Holidays” just be Christmas? I have been reading quite a bit. I will list some of the books that I have read on this site in a few days. I am now reading “City of Whispers” by Marcia Muller. She is a good author, or story teller. I love her books I don’t know if Marcia Muller is a “Cozy” or not but her books are very good. Linda, I remember reading Daphne du Maurier’s Rebecca years ago, and loving it. Also, if you get a chance to see the 1940s movie with Joan Fontaine, George Sanders, and Laurence Olivier, do! Danna, I could not finish this book. I took this book back to the library after only reading about 5 chapters. There was just way too much description for me. I do remember reading this author years ago and I remember enjoying her books but I guess I have changed with what I like to read.. I would rather an author get on with the story. I will look for the movie, though.